Congratulations to the Booth Decor competition winner fromthe September 2015 Orlando MyShadi Bridal Expo – Nikun Events Company! Born and raised in East Africa, Pinky Patel studied in England before 1moving to the United States where she spent over 20 years in an IT career. Realizing her passion lies elsewhere, Pinky began making flower garlands as part of a fundraising effort for a local mandir in Chicago. Gradually, she began taking on more work as a florist and eventually branching out to other areas of decoration. In 2006, she began Nikun Events Company. al with contemporary styles using a wide array of florals, fabrics, textures, and colors. In this issue, we chatted with owners Pinky Patel and Nalin Patel to learn more about their background and the start of Nikun Events Company. 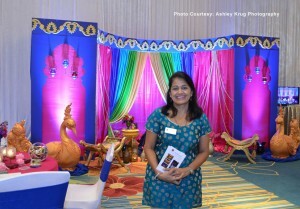 How does it feel to be the winner of the 2015 Orlando MyShadi Bridal Expo Booth Decoration Competition? 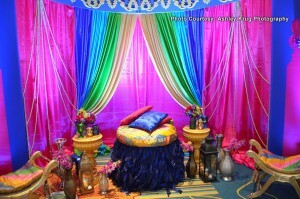 It is an honor to be recognized by those attending the MyShadi Bridal Expo. We always want to provide our clients with innovative ideas. The beauty of doing these events is that there are so many ways to express individuality and creativity. We setup two areas, one to show a glimpse of a reception setup that was mute yet elegant in blush and gold tones. 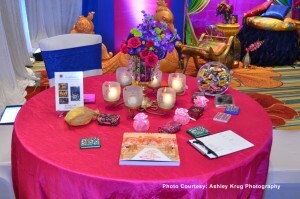 The other setup offered a glimpse into a Sangeet/Mehndi event that was colorful and bold with a touch of Rajasthan. We love to use florals and different textures of fabrics. When you combine these two elements, it sets a beautiful stage. We also use various textures, textiles and elements to create our custom frames and borders. We created the entire border of our frames for both the Sangeet/Mehndi and reception designs with cutwork of foam. This cut work can be personalized for each client. For example, we can create a design from your kankotri. 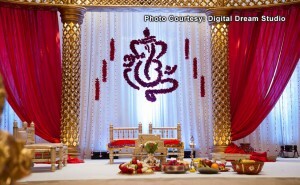 We are a complete decorating firm and offer mandap, floral, linens, and lighting. 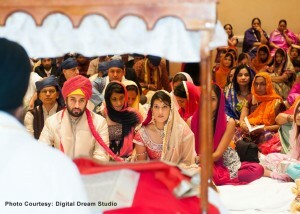 We also offer planning, coordination and complete event management services. First, we get to know the client and listen to what their overall expectations and vision are for their events. We can seek inspiration from our past work or create something innovative to achieve their vision. In the first year, we learned many great lessons. More importantly we learned that in order to grow, you must be open to giving a little bit more. This year we have also learned that in evaluating our inventory, we were able to discover and create new designs to keep our inventory fresh and innovative. In what regions (city, entire state, all over the US), do you provide your services? We service all of Florida but having said that we have sister companies in Atlanta and Chicago. We are able to service events across the country without any issues. We have so many favorite weddings, so it is difficult to select! What makes them all stand out is the fact that the couples and their family have instilled faith in our ability to translate their vision. There is so much media out there, so look for the style that describes you the best. At the end of the day, our advice is keep it simple and elegant and enjoy the day.